Add your egg yolks and sugar to a mixer. Whip it up good until the mixture turns a light yellow color. In a small saucepan add the egg mixture to the milk, heavy cream, allspice, nutmeg, and cinnamon. Heat it up to just boiling and remove it from the heat. Pour a half a cup of the hot milk into the egg mixture, whisking constantly. Add the hot egg mixture back into the rest of your milk mixture, continuing to whisk constantly. Put the mixture back on medium low heat and cook, stirring often, until it thickens. Pour it in a container and put it in the fridge to cool completely. For an added treat add chocolate syrup and bourbon. alert and your memory sharp? This book is sure to help. Christmas wouldn't be the same in our house without traditional English Christmas mince pies. I make them as gifts for neighbours and friends, and as a "thank you" gift to our obliging rural Postie, so I usually land up having to at least double the following recipe. In a large bowl soften butter, add sugar, and beat until it's thick and creamy. Add egg and beat again. Add water and beat in. Sift flour and baking powder and blend into the creamed mixture. (You can continue using your cake mixer for this.) Depending on the day and the size of the egg, more or less flour will be needed, but enough is added when the dough forms a smooth ball. Divide it into four. Weigh before wrapping and placing in the freezer. Each one should weigh 14 oz. When wanted, thaw and knead smooth before rolling and cutting out with fluted cutters. Cook at about 400°F (200°C) (or lower if using a fan oven) for about 10 minutes if you want to reheat them later, or until they are well browned if you want to serve them straight away. Will make about 4 dozen good-sized lidded mince pies at Christmas. Be generous with the filling. You can pack it in quite firmly because the fruit mince recipe below is more than enough for 4 dozen pies. I use fluted cookie cutters measuring about 7.5cm (3 inches) for the bottoms and 6.5cm (2.5 inches) for the tops. Put walnuts, apricots, raisins and peel through mincer, with half of the currants, using a coarse knife, or use a food processor. If you are using a food processor, its probably best to do the apricots on their own. Add rest of ingredients and mix well. Leave the mixture in the bowl for several hours, stirring often, then pack in clean dry jars, cover and store in a cool place. Makes about 3.5 lb mincemeat. Feel free to juggle with the ingredients. If you dont have enough of one ingredient it probably wont matter. Also, theres no way you can grate the rind of a lemon. If you dont have a zest remover, use one of those vegetable peelers with a swinging blade to remove the rind. Use light pressure so that you dont get any of the white pith. Chop the strips of rind as you would parsley. stir in cranberries. Cook on High for 3 hours, stirring once each hour. Remove the lid and stir well. Cook on High until sauce has thickened and most cranberries have popped, about 45 more minutes. Mix crust. Press into (13x9 inch) pan. Mix filling. Pour over crust. Mix topping and sprinkle over filling. Cool and cut into squares. Enjoy! My cousin is an amazing hostess who entertains lavishly and these sweet potato cupsas attractive as they are deliciousare always a part of her holiday meals.. Combine first 7 ingredients, beating well. Add orange juice until the mixture is desired consistency. and place under broiler until nicely browned. In a large bowl, beat the cookie dough, flour and extract until it's smooth. Divide the dough in half; mix food coloring into one portion. Shape 1 teaspoon of white dough into a 6-in. rope. Shape 1 teaspoon of red dough into a 6-in. rope. Place ropes side by side; press together lightly and twist. 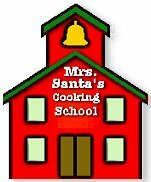 Place on an ungreased baking sheet; curve top of cookie to form handle of candy cane. Repeat with all the remaining dough, placing cookies about 2 in. apart on baking sheets. Bake at 350° for 8-10 minutes or until set. Cool for 2 minutes before carefully removing to wire racks. Yield: 3 dozen. Combine the first four ingredients in a saucepan and cook over medium-low heat, stirring constantly until mixture reaches 160:. Stir in 3/4 cup bourbon. Cool then cover and chill. Combine chilled mixture and remaining 1/2 cup bourbon in a punch bowl. Bring just to boil then simmer for 10 minutes. Pouir through a strainer and enjoy warm or hot. With a wooden spoon, beat in the warm milk or cream and butter and season with salt, pepper and some garlic powder to taste.